It is always better to be on the safer side, particularly when the subject is concerned with property. Whether you are a landlord or a tenant, creating a rental agreement to keep records of all necessary legal information is essential to protect your rights. A landlord–tenant relationship runs smoothly when it is founded with a rent agreement, and any glitch that rolls up in future, can be resolved effortlessly. 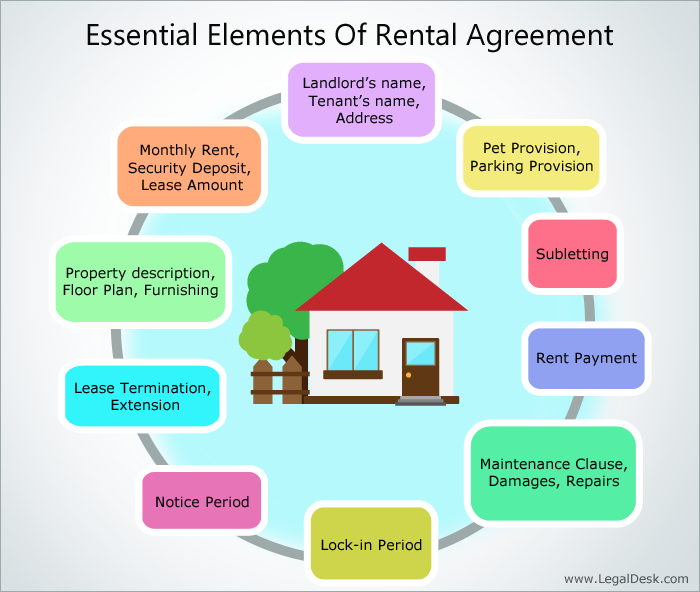 A rental agreement is an agreement form which is signed by both property owner and tenant, after negotiating on renting out a property from the owner to a tenant. Rental agreement can also be referred to as ‘lease agreement’ or ‘tenancy agreement’ or ‘agreement for rent’ or ‘rental contract’. What Details Should Be Included In Rental Agreement? The address of the property along with the names of landlord and tenant should be written precisely, and in exact letters as they use in other official work. You can even attach a copy of a floor plan or describe the property for better identification. Typically, a lease agreement includes one month notice period in case one wants to terminate the lease, but the reason should be definite. In the event of price escalation, notice period should be 3 months. Regular wear and tear is taken care of by landlord, and damage caused due to negligence of tenant should be maintained by the tenant alone. Security deposit is usually an amount equal to two or three months’ rent of tenants which landlord demands at the time when tenant shifts in the property, and returns the amount when tenants move out. It is taken for the sake of security in case tenant denies to pay rent or for damage. It is up to the landlord to decide rent payment schedule. Generally landlord collects rent on monthly basis. Penalties can also be mentioned in the rental agreement against late payment. Add as much information as much you can. You can also set limits for number of guest’s visits and stays. Most property comes unfurnished, but if you are providing some furniture, keeps record of it and its condition in order to avoid tiff later. Generally rental agreement expires after a year. Landlord can choose auto-renewal clause to renew the lease agreement naturally with same conditions. Keeping subletting clause will keep away the tenant to sublet your property without your prior permission. With the inclusion of pet provision, the property owner can guide the tenant whether to keep a pet in or not. It can be mentioned in the agreement about the parking space that will be provided to tenant, that is, how much parking space will be allotted to him. There are many other provisions that one would want to include in the agreement, for ex. about usage of common area, plants, garden and other provisions, property’s keys, etc. Few owners may prefer to add few tailored provisions in order to avoid certain anticipated risks. However, both the parties have to read the agreement thoroughly and sign it only after accepting the terms mentioned in it. Who Needs To Create A Rent Agreement? Organizing all aspects of lease agreement in one single document is not a hard format to deal with. Anybody can create his own accurate rental agreement without any legal assistance from lawyers, as long as he possesses the right knowledge to include all the obligatory clauses. In general, the need to create rental agreements arises in the following contexts. Any homeowner who wants to lease/rent out a room in his house to a tenant. When To Make A Rental Agreement? Rental agreement is the most crucial tool of property renting that must be used before handing over the keys of your property to tenants. By doing so, one can minimize the possibilities of misinterpretation concerning the rights of both landlord and tenant. Generally, the owner or manager of the property creates a rental agreement and then the tenant, after reading thoroughly, signs the agreement. This makes both of them aware about their exact responsibilities and rights. Once drafting rent agreement is ready, all you need to do is get it printed on a stamp paper. The document has to be signed by the landlord, tenant and two witnesses. With these simple steps, now you can create your own rental agreement with ease. 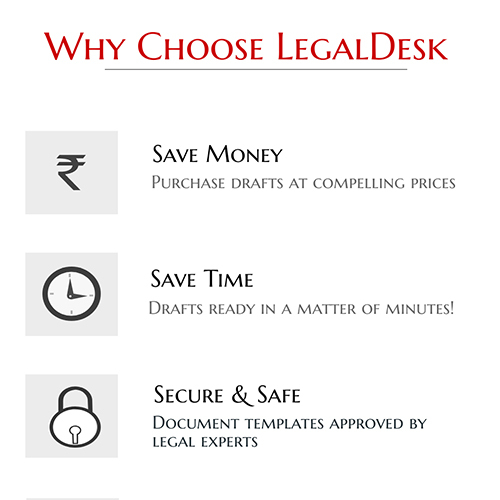 LegalDesk.com offers you ready to use online rental agreement format, by which you can create a rental agreement within minutes. All you need to do is just fill in your details in the blanks provided and while doing this, you can also see the preview of the document getting updated alongside. With this, you can create agreements for rental houses, flat rentals, PG rentals, rooms for rent and also commercial rentals. Now click on the button below to get started. There are 14 comments on "Important Things To Know About Rental Agreement".